Plain speaking, combative and ubiquitous, Central Bank of Nigeria Governor Sanusi Lamido Aminu Sanusi was never going to work well with the taciturn and cautious President Goodluck Jonathan. After months of cold war between the two men over reports of billions of missing oil revenue, President Jonathan suspended Sanusi from the CBN on 20 February. That will escalate the political battle and rattle investors a year before general elections. Jonathan acted against Sanusi after the outspoken Governor had warned the Senate on 13 February of the dangers of deepening corruption in the oil and gas industry and submitted a report detailing the failure of the state oil company to transfer some US$20 billion to the federation (national) accounts. Those revelations and the failure of Oil Minister Diezani Allison-Madueke, a close ally of Jonathan’s, to give a credible response to accusations of gross mismanagement and illegality, sent investors into a spin. For example, it was confirmed in the Senate hearings that in 2009, the previous government had banned state subsidies on kerosene yet Allison-Madueke had maintained a system of state subsidy for kerosene costing over $1 bn. a year. • Unaudited third-party financing claims of about $2 bn. a year. Faced with this litany of infractions, Ngozi Okonjo-Iweala, Economy Minister and former Managing Director of the World Bank, proposed a forensic audit of the NNPC, but one ringed with caveats. Okonjo-Iweala is now in an iniquitous position: she is the sole high-profile reformer with policy-making powers on the wider economy but still politically identified with Jonathan and Allison-Madueke. Seeing Okonjo-Iweala’s continuing foreign credibility (London’s daily Financial Times backed her for World Bank President), Jonathan’s team encourages the idea that she could run for vice-president in 2015, and president in 2019. Yet that cuts little ice with market forces. Within hours of the 13 February Senate hearings, the naira had slumped to N165 to the US dollar, the sharpest depreciation in five years. The value of shares on the stock exchange fell faster than in any other capital market. Although CBN Deputy Governor Sarah Omotunde Alade, who will take over the governorship until June, is a well-regarded technocrat, bankers and investors worry about the signals sent by Sanusi’s suspension and the lack of concern about the state accounting issues that he raised. The President and Oil Minister have shown an almost surreal insouciance towards data showing billions of dollars missing from state accounts, even when the data is produced by government officials and on one occasion, by a committee working under instruction from the Oil and Finance ministries. Again on 20 February, within hours of his suspension, Jonathan’s aides were more intent on trying to denigrate and sideline Sanusi than steadying investors’ nerves. Jonathan launched unsubstantiated accusations of ‘financial recklessness’ against Sanusi, then named Alade as Acting Governor and within hours had sent his choice for the new governor, Zenith Bank’s Chief Executive Godwin Emefiele, to the Senate for confirmation. The market made its own judgement: that same day, the exchange rate fell by another four naira, to $1 = N169. 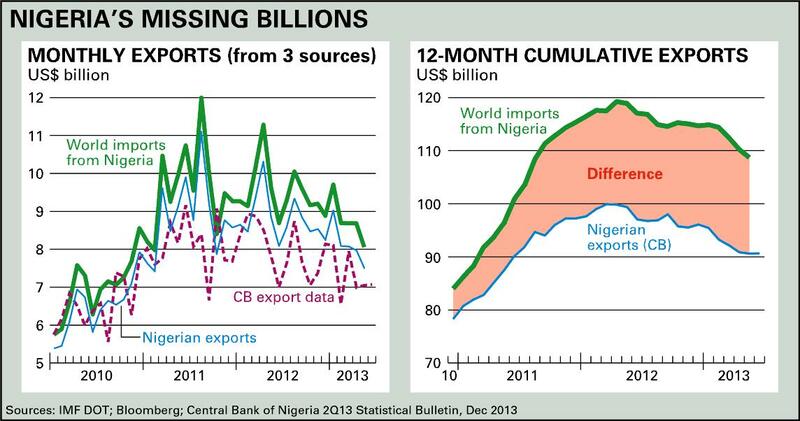 This will matter hugely, even if Nigeria’s ballooning growth is on automatic pilot. Government statisticians are just about to announce that the country is now Africa’s biggest economy, with a gross domestic product of around $400 bn. That puts it about $40 bn. ahead of South Africa and slightly less ahead of Iran, Columbia and Thailand. This was intended to make great propaganda for Jonathan’s campaign in the 2015 elections but it will be fairly meaningless for most Nigerians. Average income per capita will be about $2,400 a year: that’s much less than in an Egypt in turmoil and less than a third of average incomes in South Africa. Central to Nigeria’s economic problems is the failure of the state to provide basic services such as electricity and water, let alone decent standards of education and healthcare. Much of this is due to chronic under-investment: that reality has given Sanusi’s critique of the mismanagement of state oil revenue great resonance among many Nigerians. In the hours after his suspension, it was Sanusi, not the government, who tried to steady nerves. He strongly praised Sarah Alade’s professionalism and managerial competence. Prepared for Free Article on 23/04/2019 at 17:48. Authorized users may download, save, and print articles for their own use, but may not further disseminate these articles in their electronic form without express written permission from Africa Confidential / Asempa Limited. Contact subscriptions@africa-confidential.com.